TCMS V2 is FingerTec’s bundled software since 14 years ago and over the years we have made progress on the software front. Earlier this year we have introduced the latest and more powerful bundled software TCMS V3 designed for time attendance purpose. 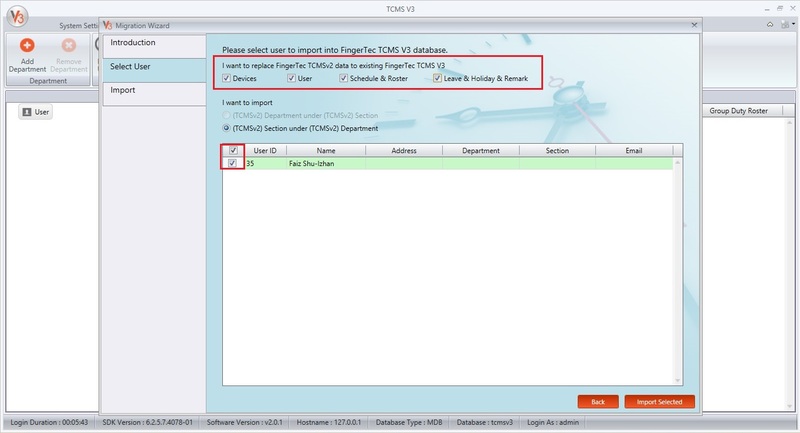 Now, you can migrate your data from TCMS V2 to TCMS V3 software easily. Learn how. However, please note that the manually edited data in your TCMS V2’s attendance will not be migrated because the data migration only takes the raw clocking in your Audit list, and generate a new attendance sheet in TCMS V3. Note : We are strongly recommending user to do housekeeping before migration process for large scale database so that it can decrease migration time and enhance migration process.You can refer here on how to do housekeeping in TCMS V2. 1) Backup your TCMS V2 software database at TCMSv2 > System Settings > Backup/Restore Database > Backup Database. 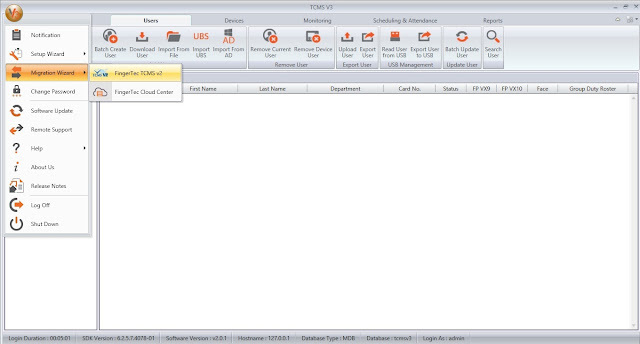 2) Now, go to the TCMS V3 software > Click v3 icon > Migration Wizard > FingerTec TCMSv2. 3) Click browse and choose your TCMSv2 backup database and click upload. 4) Select all employees and tick all options that you want to migrate such as devices / user / schedule & roster / leave,holiday,remark. After done, click import selected. 5) The migration process is finished when the zip file has been imported successfully. 1. Please ensure you activate your device in TCMS V3 so that you will have full access to all tabs. Before activating any device, only these selected tabs: System Settings, Users and Devices are accessible. Monitoring, Scheduling & Attendance and Reports are initially disabled. 2. Go to Devices, select the device > click Activate Device. System will automatically activate the old device with the TCMS V3 software through online activation. 4. TCMS V2's and TCMS V3's license keys are different, so you will not be able to use the previous activation key. 5. 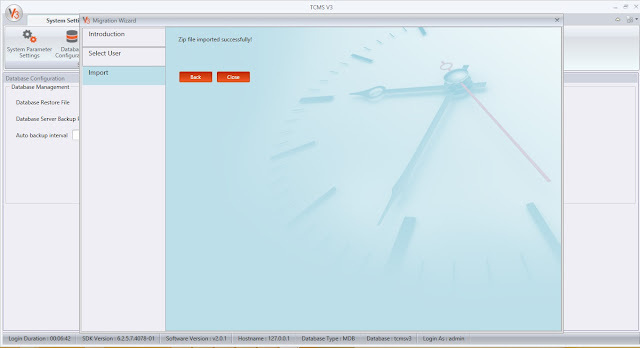 It is advisable for users to disconnect device from TCMS V2 once you successfully connect device to TCMS V3 software. Once you have downloaded data into TCMS V2 software, it will automatically delete transaction data from the device and you will not be able to download that data into TCMS V3. 6. If you are testing attendance and reports after the migration, firstly, please generate attendance for all users to ensure relevant data enters the attendance sheet (Scheduling & Attendance > Attendance Sheet > Generate > Select User ID and Date Range> Ok). Also, check user Issuance Date and ensure that it is prior to the date selected for generating attendance. For more guidance on TCMS V3 such as user manual, video guides and training slides, please visit our website at www.fingertec.com/software/ and select TCMS V3 or click here. please can you tell me if i am right. For your information, R2 is the access control device. So in this case we would like to recommend you connect and use the Ingress software instead of TCMSv3 software. It is because, the TCMSv3 software was developed to work as Time Attendance system only and cannot support any door access features like Ingress software. You can refer to the following tips and newsletter on how to migrate the TCMSv2 database to Ingress software. Do i can connect R2 device to TCMS v3? Do you have answer ? You can connect R2 device to TCMS V3 by using offline activation. Kindly send an email to support@fingertec.com together with the serial number of your device for us to generate TCMS V3 offline activation product key for you. is it necessary to regenerate activation key again? For your information, TCMSv2 and TCMSv3 license is a different, so you cannot use the same activation key used in TCMSv2 to activate the device in TCMSv3 Software. Please send your device serial number to support@fingertec.com , so we can generate TCMS V3 offline activation product key for you. Our system will automatically generate the product key and activation code. i try to install from CD, also download v3 installer, but both giving me such error. "windows cannot access the specified device, path or file. You may not have the appropriate permission to access the item"
Please turn off your antivirus and window firewall during installation. Please uninstall the software( delete the TCMSv3 folder in program file ) and install it back using the latest version. thanks for the files, able to install into win7/win10. do you have any installer for winXP ? it is due somehow not able to install into XP OS using the CD? probably you have another version for WinXP SP3? Then paste it into your browser (Google chrome, internet explorer,etc) and enter. It will automatically download a new installer which is the latest version of TCMCSv3 that can be used in Windows XP. really want to upgrade to v3 i have 6 devices in total with around 800 employees and around 5 years worth of data. can you migrate it for me i will send back up file from v2. In regards to your inquiry, kindly follow all the guidance provided above to perform the migration as you need to do the housekeeping steps too. Is advisable for you to perform housekeeping first before backing up your database, so that the database will not be too heavy, which will require a lot of time to be migrated. Please follow every steps in order to migrate the database successfully. I can't use this new software for now there are features in v2 that is really required for us. like department and section we use this one for custom reports. 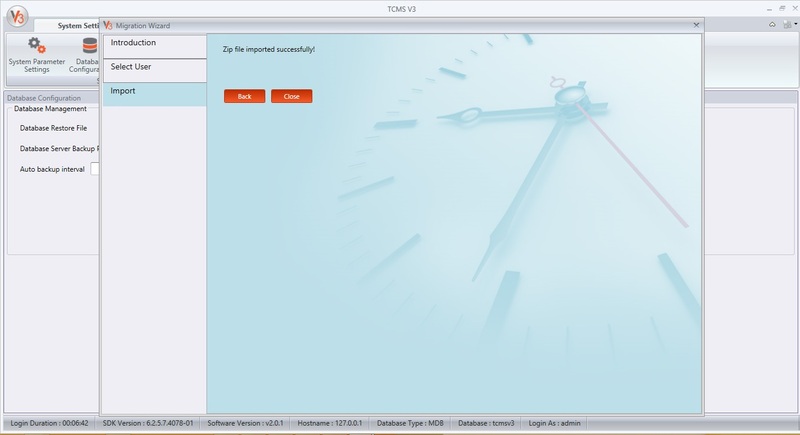 Hi There, I am trying to perform the migration from TCMS v2.2.027 to the new TCMS V3 using the migration Wizard. I have successfully performed the backup on the old platform as a zip. When importing the file, the wizard successfully imports the zip. I can see all existing users. When selecting all users and then Import, "A crash has been detected by TCMSV3. Can anyone advise me with a workaround/solution please. Then regarding on the crash issue during migration process, kindly provide us the TCMSv2 backup database. you can send to support@fingertec.com , so we can check and migrate TCMSv2 database into TCMSv3 database. We have checked and re-backup your TCMS V2 database by using latest version of TCMS V2 (version v2.2.027 19-10-2016). The issue you've encountered is because of your TCMS V2 software is not the latest version. I'll reply your email and send you the database that have been re-backup by latest software version of TCMS V2. We also have tested the database by migrating it to the TCMS V3 and it is working fine. Thank you very much for the help. Greatly appreciated. I have been using TCMSv2 for over two years and about 6 months ago when I inquired about V3 I was advised NOT to install V3. Can I install now? Thanks. With regards to your query, yes you can install the TCMSv3 software and migrate your TCMSv2 database to this new software. You also can download the latest version of TCMSv3 software from the following link. I have a problem with my ingress time attendance report sheet and my clients are not satisfied with my report. I'm using R2/R2c as slave n master. In my users movement analysis. "O" should OUT, while "1" is IN.but this not so in my reports. The O and 1 appears indiscriminately. I was told that user must press the IN/out button in the R2 to get correct in or out register but my clients wouldn't have the time or patient to press IN/OUT button before flashing their cards or finger prints. Pls is there any way to set the system to write O when the R2 master is used and 1 whenever the R2c is used. With don't want to be pressing the in/out button on the R2 before clocking in or out. Go to the device menu > sys option > adv option > antipassback > NoA. After you set this, please check again whether the result still same or not.